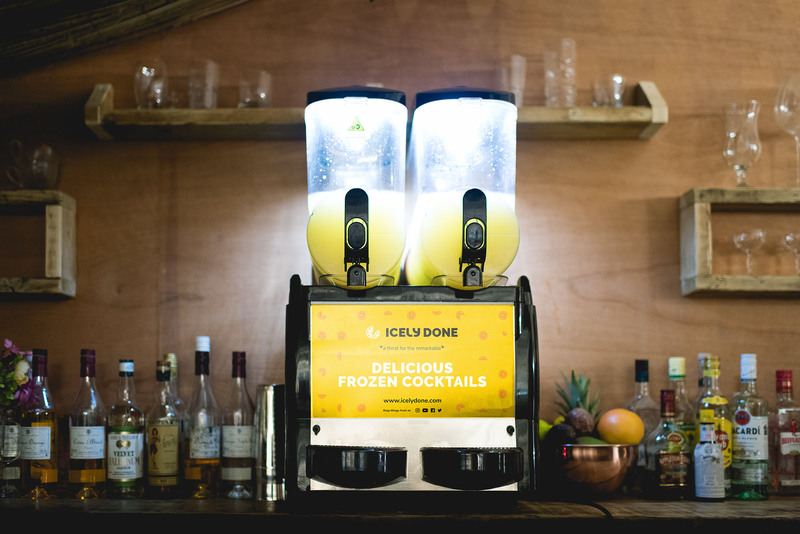 Icely Done are a UK based company who produce handcrafted, imaginative and delicious cocktail blends. They already had a logo, but were looking for a refresh as they were aware that their brand image was inconsistent and was falling short of their high standards. They needed my help to bring consistency to their branding and to create a fun, fresh and professional image to compliment their cocktail blends. The logo and branding had to work across many disciplines, from labels, brochures, menus and a van livery all the way through to web and social media. Something my clients benefit from is my 14 years experience in a self-adhesive graphics company, designing for print ready manufacture, so there is no issues when it comes to designing for all types of brand collateral. I designed a number of logo options, all of which I presented alongside some potential brand assets (graphical elements). This way you as the client can start to visualise what your brand will look like in reality, which is so important. I find this takes away any potential unpleasant surprises later on should things not be quite what you expected. I designed a mixture of handcrafted logos along with crips geometric logos, as both styles fit the design brief. 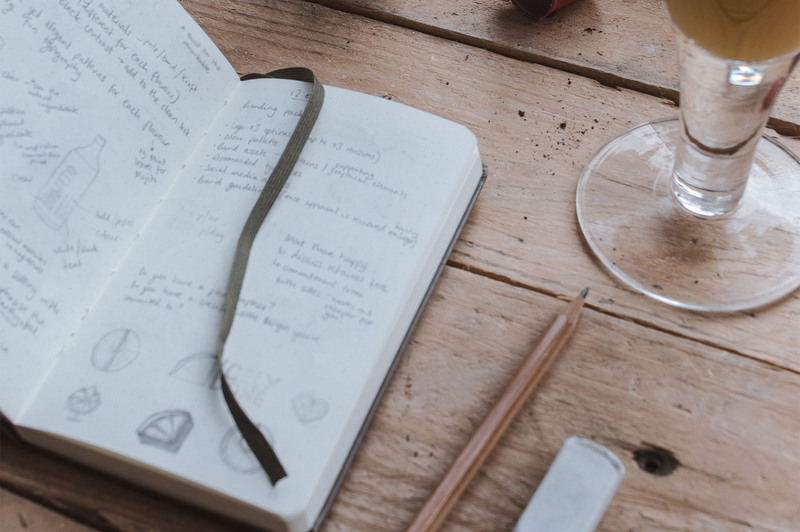 I always want to be sure that you have a number of different great options to choose from, and therefore I’m make it my personal challenge on every project to make the decision process as difficult as possible. If I don’t love it, I don’t submit it. So you can be sure you’ll end up with a logo and branding that you love. It was a long and difficult decision for the client, of which resulted in an online poll. 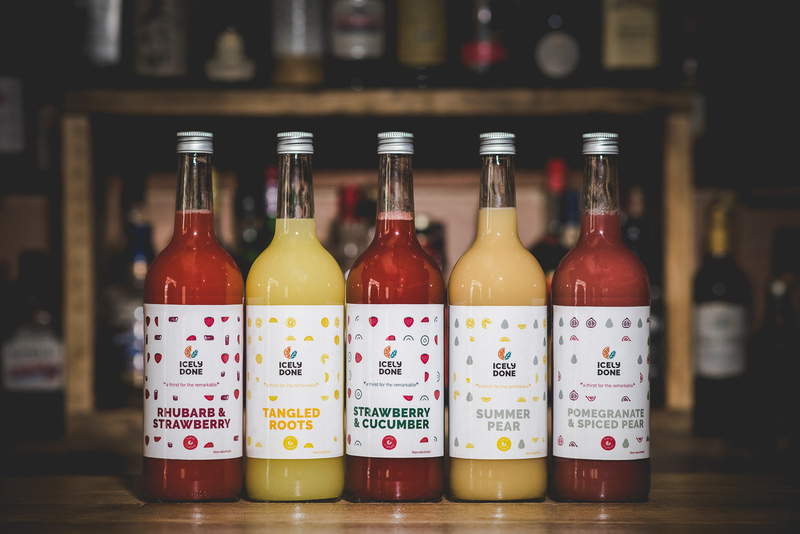 Eventually the team over at Icely Done set on a logo option that consists of a hand drawn icon element that compliments the handcrafted nature of their cocktail blends, along with a bespoke clean typeface to bring balance to the overall logo. To set the brand apart from its competitors I also hand drew all of the ingredient assets, combined with clean white space to give that natural and fresh feeling to the products. I then arranged these assets in a loosely structured format and created patterns to suit each flavour. These assets are now used across of of their branding collateral and is making them stand out. The client was overwhelmed with the result and loved their new logo and branding design. 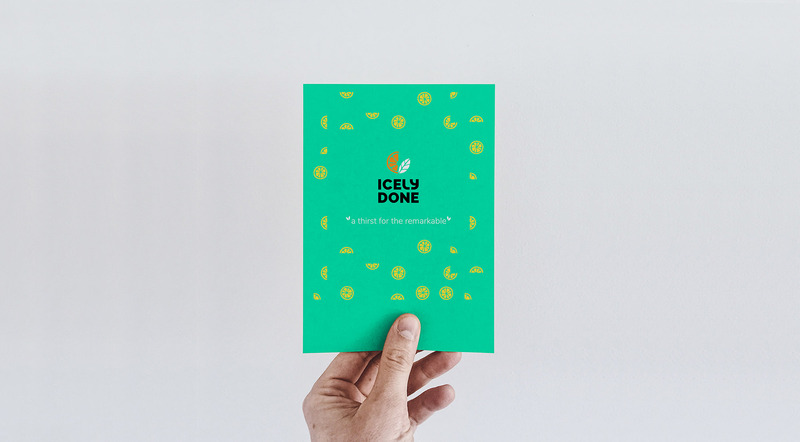 It’s a strong, bold, fun and clean brand image with handcrafted touches that really represents Icely Done’s business values… something I set out to do on all projects. 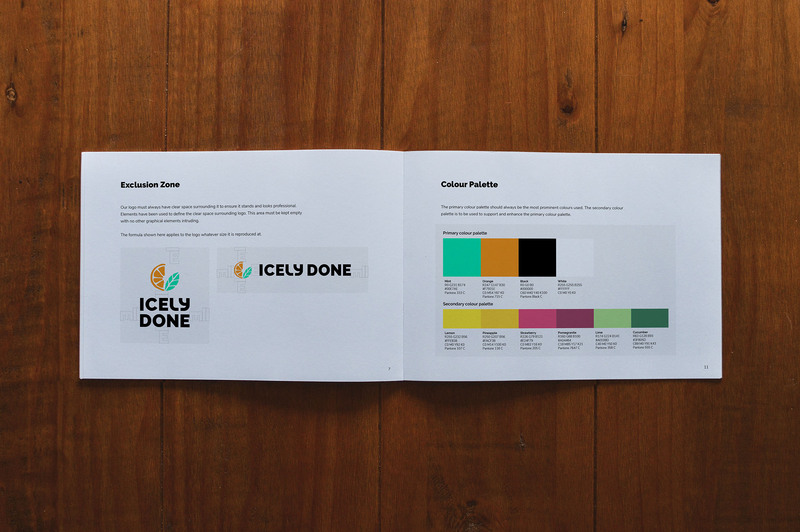 Once all the elements were signed off I worked up a brand guidelines booklet in order to create a framework that all future design collateral can follow. This now ensures consistency that they had lost with their previous brand image. 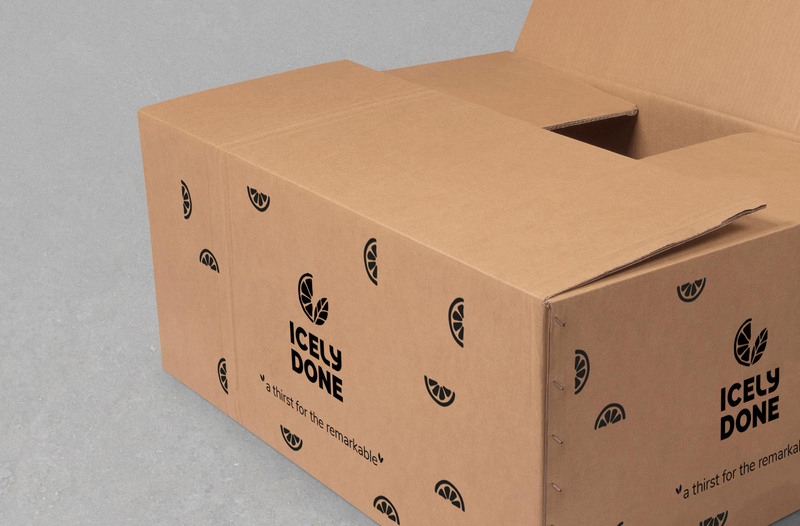 Following the logo and branding project with Icely Done, I have built an ongoing relationship with the team on all of their graphic design requirements. Right through from the product labels and brochures, to exhibition stands and vehicle livery designs. I love to develop long lasting relationships with my clients and find this the best way to achieve brand consistency, which builds recognition and trust with their clients, and ultimately more sales.